Did you know that the number of Valentine’s Day cards sent each year around 14th February adds up to even 150 millions? Or that the love-sharing tradition dates as far back as the Middle Ages when rich merchants sent heart-shaped gifts to their customers as a token of gratitude? Hold on. Do not believe the second one. We have just made that up to set the mood for telling you this: you are the heart and soul of our business, and we very much wish our cherished partnership to continue for ages! And how do you personally like the idea of working with us and incorporating our software into your daily business strategies? 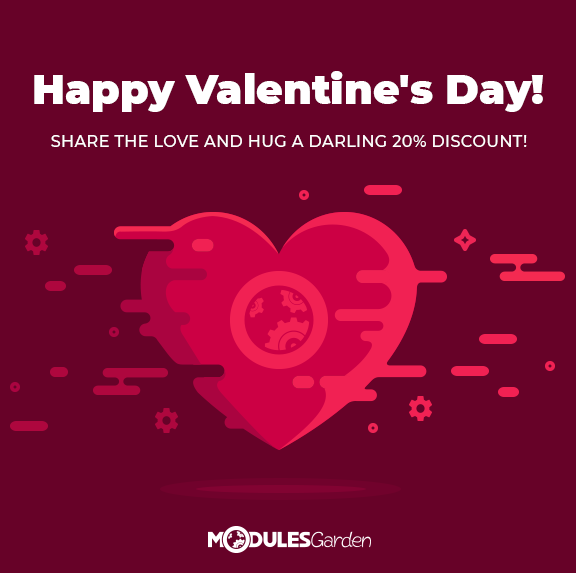 Choose a module or extension from our broad offer that you care about the most and give it some encouragement on our Product Marketplace. By way of illustration: if it is our newest WordPress Manager For WHMCS that stole your heart, jump to its ‘Reviews’ section and tell us exactly how you feel about it! Once you have spoken the magical words, simply contact us via a ticket titled ‘My beloved module’. And finally the last, most enjoyable part – embrace a darling 20% discount applying to all products in their annual version available at our Marketplace! Hey, it is Valentine’s Day after all, so why won’t we go totally wild? Submit as many reviews of your favorite pieces of software as you desire and we will reward every single one of them with a separate discount! Remember that love can be whimsical though and will wait for no man or woman – hurry up to express your feelings before 19th February! Show the Strength of Your Affections! We very much appreciate your fondness for our module, Salah! You will be provided with further instructions regarding our promotion in the ticket you have opened in next to no time. I am deeply sorry to inform that our Valentine’s Day promotion is already over. Perhaps we could attend to your needs in some other way? Open a ticket to our Product Pre-Sales Department and we will eagerly look into your matter right away!